Last fall I wrote about glory to God forever and ever, based on the end of Romans and on the end of Jude. 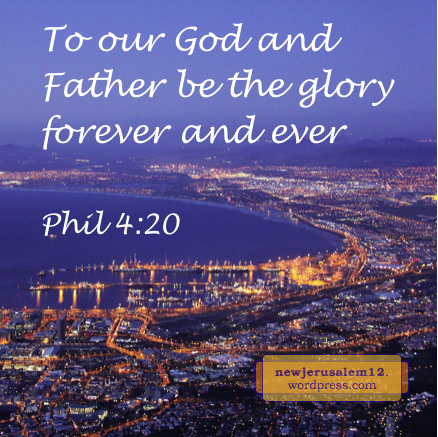 The phrase “forever and ever” points to the eternal New Jerusalem. In recent reading I realized that glory to God forever and ever is in many New Testament books. Here are the verses from Paul’s epistles. May the words of the Bible be ours, not only in New Jerusalem but also now, so that we declare to our God and Father be the glory forever and ever. On the cross the Lord created two peoples—Jews and Gentiles— “in Himself into one new man, so making peace” (Eph. 2:15). This oneness consummates in New Jerusalem. In John 17 the Lord Jesus prayed for the practical outworking of this oneness. His prayer includes three stages. The foundation for this prayer is in John 10:30, “I and the Father are one” because “I am in the Father and the Father is in Me” (14:10). The oneness is neither an outward association nor a mental agreement; this oneness is by mutual indwelling. 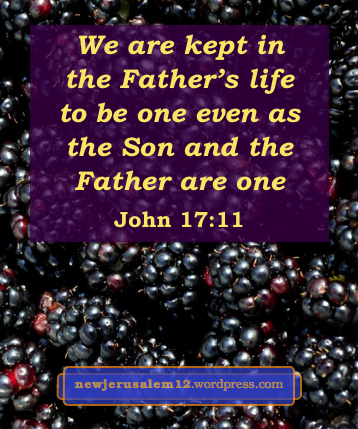 In John 17:11 Jesus asked the Father, “keep them [all His disciples] in Your name, which You have given to Me, that they may be one even as We are.” The oneness for which the Lord prayed is at the same standard and in the same manner as His oneness with the Father. This is the oneness which He longs for today and which will characterize New Jerusalem. To be kept in the Father’s name is to be kept by His life, because only those who are born of the Father and have the Father’s life can participate in the Father’s name. * When we are kept in the Father’s divine life, we are one. This is how the new man, the Body of Christ, and New Jerusalem are one. Father, keep me in Your name and in Your life day by day to be one with You and with all other Christians. *An extract from note 2 on John 17:11 in The Holy Bible, Recovery Version, www.recoveryversion.org, © 2003 by Living Stream Ministry. Revelation 21:3 declares, “Behold, the tabernacle of God [New Jerusalem] is with men, and He will tabernacle with them, and they will be His peoples, and God Himself will be with them and be their God.” This is wonderful. However, while the peoples around New Jerusalem have God as their God, they do not have Him as their Father. They do not have the divine life which incorporates people into New Jerusalem. Regarding these peoples, Revelation 21:3 promises, “God Himself will be with them.” We could say, God will be their neighbor and they will be God’s neighbors. This is wonderful, but it is far short of the condition of the people built into New Jerusalem. Besides this verse in John, many verses in the epistles speak of Christ in us; examples are “Christ is in you” (Rom. 8:10) and “Christ in you, the hope of glory” (Col. 1:27); also look at this Bibles for America post. 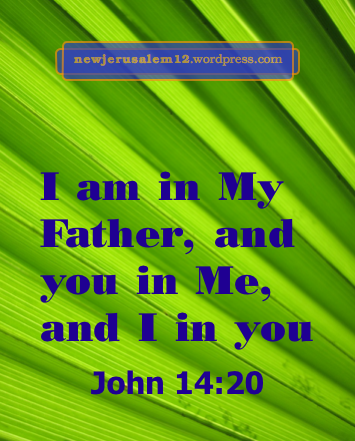 Christ is in us and we are in Christ; examples are “of Him [God] you are in Christ Jesus” (1 Cor. 1:30) and “You are all one in Christ Jesus” (Gal. 3:28). Being in Christ and having Christ in us is the essence of New Jerusalem, a blessing much higher than being around New Jerusalem.